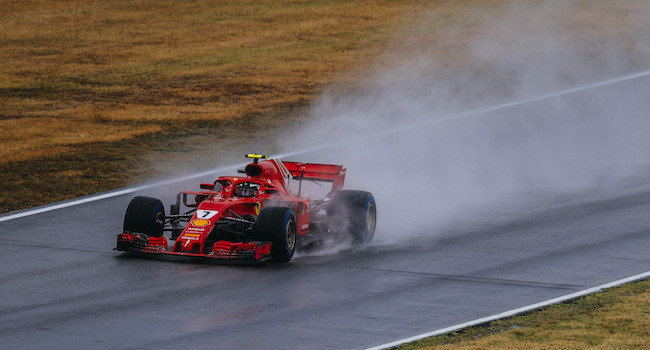 A possible win for Ferrari at the German GP became an open wound as Sebastian Vettel retired from lead on lap 51 after making a mistake in the rain at turn 13. The Italian squad left Hockenheim with only 15 points, courtesy of Kimi Raikkonen's third place finish. Vettel started the race from pole and, having been the only driver to score points in every race so far this season, suffered his first retirement of the season. Both cars got away well at start, with the focus being on the lead car to manage an advantage of around 4 seconds of second place. At the end of lap 14 Raikkonen pitted as scheduled, rejoining the track ahead of Hamilton, who was working his way up from 14th on the grid. The Finn immediately set the race fastest lap and was ready for a remote battle with Bottas who was yet to pit. On lap 36, Vettel was within DRS distance of his team-mate who had blistering on his rear tyres. As they were running different strategies there was no point in an inter-family duel and on lap 39, the German got ahead of his team-mate at the hairpin. With 24 laps remaining, Hamilton switched to the Ultrasofts, clearly gambling on dry conditions. A few drops began to fall at turn 2 and a light shower hit turn 6. Vettel confirmed on the radio that he could still stay out, but a piece came off his front wing. At the time, the data did not show any accompanying loss of downforce. It looked as though for those opting for rain tyres, the gamble had not paid off, but the rain went and came so that the pit lane was also wet. Some cars spun, others tiptoed around while Vettel planted it in the barriers at the entry to the Motodrom. “There’s not much to say: I made a small mistake which had a huge impact on the result. I braked just a tiny bit too late for the corner, locked the front tires and then the rear ones, so that I couldn’t turn the car anymore," Vettel explained. As the Safety Car came out, Raikkonen took the opportunity to pit for Ultrasofts. He was now third on fresher rubber, prior to the restart on lap 58, and had a ringside seat for the duel between the two Mercedes. There were 7 laps to go and the threat of rain returned. “It was pretty difficult out there today,", said Raikkonen. "Surprisingly, in some corners there was decent grip and in some others there was none at all; we could feel the rain especially in Turns 2 and 6. It was hard to tell when to slow down and where the grip was. Obviously, you had to make your decision before the braking zone, knowing that if it happens to be wetter than you expected, there’s not much you can do.